Originally, ANZAC Day in Australia was to remember the ANZACs - soldiers who fought in Gallipolli during World War 1. Generally though, ANZAC Day is a national holiday set aside on April 25 for us to remember all Australians and New Zealanders who have lost their lives in wars and conflicts. 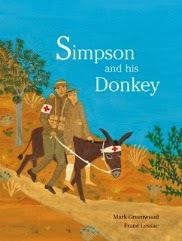 Because many parents, teachers and librarians do their best to help children understand the spirit of ANZAC Day, I want to introduce some books you might appreciate. Midnight is a children’s picture book by Mark Greenwood and Frane Lessac. It was published by Walker Books Australia in 2014. RRP $Au27.95. I really enjoyed the narrative non-fiction format Midnight is written in. I am a Story person myself; so too are many kids. The narrative style helps them come to grips with the facts they learn in this book. 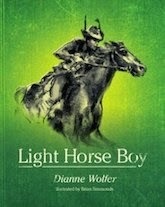 Obviously based on meticulous research, and dedicated to the Light Horsemen and their horses, Midnight is above all a story of one man and his horse. The Charge at Beersheba is brought to life for us through the eyes of Guy Haydon and Midnight. Lessac’s striking illustrations perfectly complement Greenwood’s evocative text. 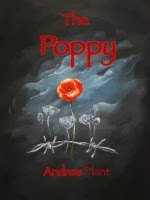 The Poppy is a children's picture book by Andrew Plant (Ford Street Publishing 2014) RRP $26.95 via Pan Macmillan Australia. The Poppy is not so much a story as a description of a significant event in Australia’s history. 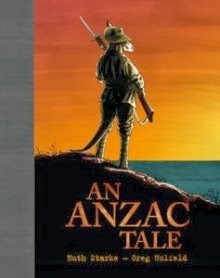 Accompanied by more than seventy paintings that manage to convey both the sombre reality of so many lives lost, and the joyous celebration of a link forged between two countries, The Poppy makes another excellent children’s picture book for schools that need to augment their ANZAC Day resources. Although not specifically about Gallipoli, the fact that it sprang from a WW1 event and that it shows the positives that can come from conflict definitely make it qualify, in my opinion. Meet the ANZACS is a children's picture book written by Claire Saxby, illustrated by Max Berry and published by Random House Books Australia, 2014. Find another review of Meet the ANZACS and The Poppy via Barbara Braxton's The Bottom Shelf. This children's picture book was written by Dianne Wolfer, illustrated by Brian Simmonds and published by Fremantle Press (2013.) It's been shortlisted in the 2014 Children’s Book Council of Australia’s Book of the Year Awards. Check out Excellent Resources for Anzac Day 2015. 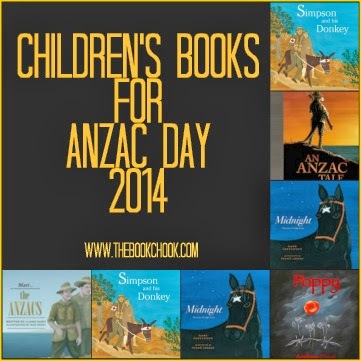 Find more wonderful books with an ANZAC theme via the CBCA's Reading Time. Find other children's book reviews at The Book Chook via the Reviews button in the right sidebar. Thanks Erin! You have some new to me there for sure!